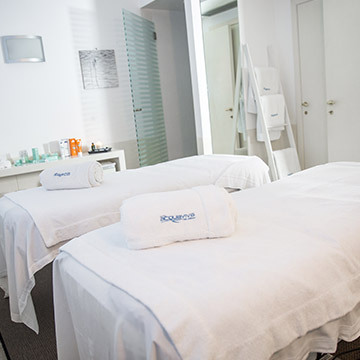 Holidays of total relaxation can be enjoyed at the Hotel Acquaviva del Garda thanks to its large wellness centre, unique of its kind. A large space immersed in a simple environment, enriched only by the comforts provided by the equipment, designed to recover new equilibrium and vitality. A course of total pleasure, which goes from the sauna to the Turkish bath, from the emotional showers to the hydromassages, and then to the relaxation zone with herbal tea and personalised treatments in the cabins. For those who wants to be in shape and for all those who live the holiday as a way to regenerate through fitness, the Hotel offers a GYM with the most modern equipment. *The Day SPA entry includes the access to the SPA and the GYM, a drink of your choice (soft drink, beer or extracted juice), bathrobe and swimming cap.